As each town’s architecture is distinct, so is the art. 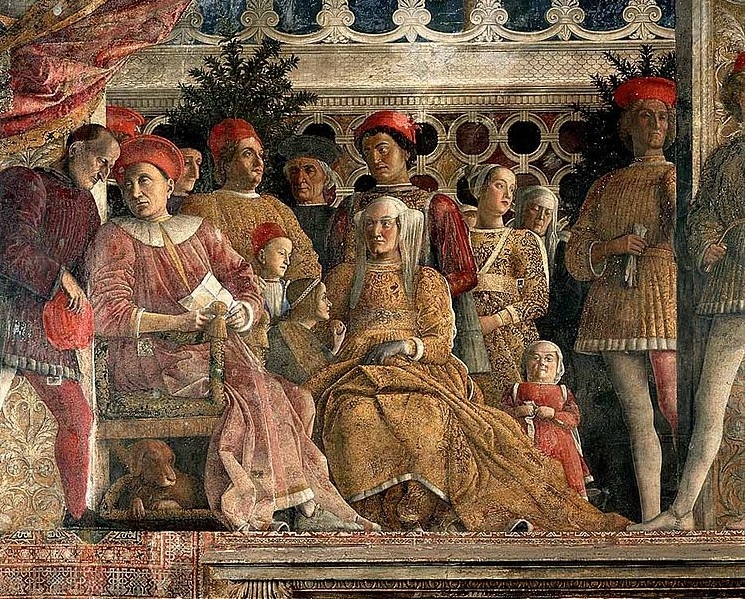 Ferrara and Mantova were duchies for many years, under the Este and Gonzaga families, respectively, and even though they were eventually absorbed into the Papal State, their aesthetic seem no less independent than their politics. Our timing, at New Year, limited what we could see of Ferrara, but a few things stood out: the magnificent city walls, of course, the stunning cathedral with its unusual mix of Romanesque and Gothic styles, and its two coolest native sons: the Dominican friar Savonarola and the über-director Michelangelo Antonioni (Deserto Rosso, Blow Up and Zabriskie Point). 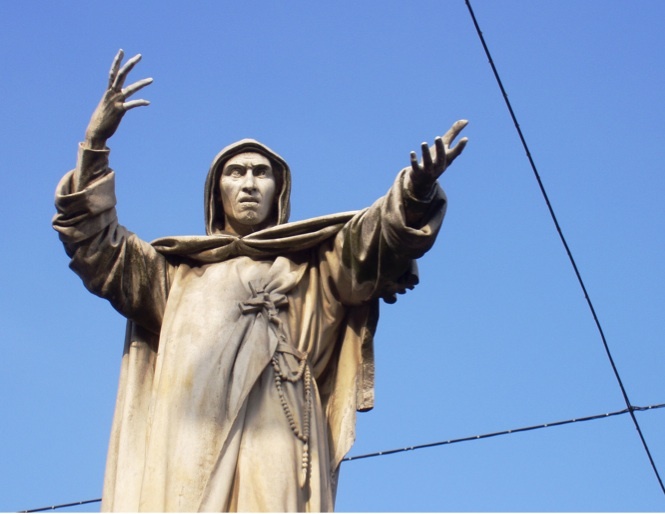 Savonarola’s story is not irrelevant today: the Medicis and the Borgia Pope Alexander VI both needed their bankers, usurers that they were, to finance the costs of war and court, yet the firebrand’s sermons and “bonfires of the vanities”, railing against conspicuous consumption, money, and decadent art, struck a chord with the common people. He did well for a time, until the powers-that-be could suffer him no longer, and he too was excommunicated, arrested, tortured, and consigned to the pyre. We stood outside the Palazzo Ducale, which was laced with explosives for New Years, burn crimson, lime and white, just under Savonarola’s statue. Incidentally, we could better reflect on his sermons after a draught of Sangiovese from Emilia-Romagna at an enoteca next to Ai Brindisi on Via Adelardi, great music, loud, tiny, and young crowd. Ai Brindisi itself left us with mixed feelings – food was acceptable, it’s obviously quite touristy, and the service lacked warmth but was perfectly civilised – in fact it felt a little like a Covent Garden restaurant. For aperitivi, a bar called Tiffany was our favourite, it seemed to have all the local bohemians and winos, very welcoming they were, and made great Negronis and very nice stuzzichini. We went there 2-3 times a day. Lastly, we very much enjoyed were two convents, one of which, San Antonio in Polesine, is notable for its great frescos but also an unusual Christ, ascending his cross on a ladder. It takes a certain bravery to knock on the convent doors, but the nuns were very nice (especially at the convent with the graves of the Este family). 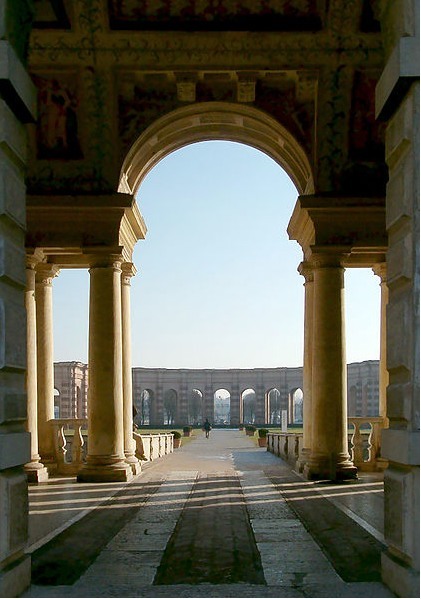 Mantova is quite different, set, somewhat improbably, upon a tripartite man-made lake, with the River Mincio nearby. It is hugely atmospheric, fog-bound, and confusing to walk around, whereas Ferrara’s centro storico is laid out essentially as a grid. Sadly, the recent earthquakes basically meant that the Mantegnas, including his tomb at Sant’Andrea, were shut, hence the art viewing was a little lop-sided – we greatly enjoyed the curvy and sensuous Mannerism of Giulio Romano’s interior decoration, and exquisitely lean architectural vistas, at the pleasure villa Palazzo Te. But this had no counterpoint – what would have come from seeing the august, stone-like, block-faced, figure of Mantegna’s Ludovico Gonzaga. There was none of the almost mathematical spatiality of Mantegna’s cities, in which the rectangular keep of Mantova’s Ducal Palace is easily discernable, nor the Renaissance legs of courtiers, clad in lively two-tone silk. We have resolved to get to Hampton Court to see the works bought by Charles I of England, and fortunately, most of the ruined and fragmentary frescos were visible in the Ovetari Chapel of the Eremitani in Padova (very close to the Arena Chapel). Andrea’s house, organised with a circular courtyard, however is well-preserved as a community arts centre, and had a tight little show of the 20th century architect Antonio Monestiroli. As written elsewhere on eatthehipster, the food in Mantova is excellent, ranking somewhere between Ferrara and Padova in quality. Incidentally, the careful observer in Mantova, and its surrounding area, sees played out much of the political history of Italy in the turbulent, yet golden, 150 years after 1100 AD. Mantova was a fief of Matilda of Canossa, La Gran Contessa, who played a leading role in the running battle between Papacy and Holy Roman Empire known as the Investiture Controversy. It was at her castle of Canossa that Emperor Henry IV begged, on his knees in the snow, the Pope’s pardon in 1077, a story touched upon in Luigi Pirandello’s great play and Marco Bellochio’s film. A hundred years later, the foremost of the medieval emperors, Frederick II Hohenstaufen, known in Italy as stupor mundi (“wonder of the world”), fought his most important battles against Popes Gregory IX and Innocent IV, on these same Lombard plains. Much later, we see the Gonzagas, descendents of the famous Paleologi of Constantinople, become extinct, leading to the War of the Mantovan Succession (a similar story happens in Ferrara, where the glorious city of the Este is claimed as a vacant fief by the Papacy, when the prince leaves no male heir). We’ve written about Genova elsewhere on this blog, but briefly, she forms a most interesting contrast with Venezia. Both were great maritime, mercantile, and military states, yet somehow, they feel very different, well beyond the obvious geographical points. Genova is a city of wealthy burghers, merchant princes, and is intrinsically linked to the life of the port. There is very little of the bejewelled glitter of her Adriatic rival, relatively little of her oligarchic splendour, virtually none of the slightly camp stylishness. If Venezia is like Manhattan, La Serenissima, an elegant, improbable, impractical, self-absorbed island that only takes outsiders on its own terms, Genova is more like London, La Superba, slightly dowdy, money-grubbing, pikey, yet outward-looking, and willing to accept foreigners freely. The reasons for the differences are diverse and this isn’t the place for them, but the art in Genova is similarly less glittering than that of Venezia. This is not a criticism; rather, because of Genova’s relative unpopularity (seems many tourists come off the ghastly cruise ships, quickly rush over to the acquarium, and/or head down to the Cinque Terre/Portofino), the museums are relatively empty, and the guards are absolutely charming, particularly if one has any Italian at all. They will happily answer questions, sometimes with great volubility, and have the traditional Italian soft spot for London (“Babylon” in the words of one guard, and seen in the suits of Milanese businessmen – La Stile Inglese). More generally, we found Genovans to be quite friendly, not least when one is lost near the disturbing back-streets of the port: they repeatedly approached us to ask if they could help. Our favourite art: Palazzo Spinola, and the 3 museums on Via Garibaldi, the Palazzi Rosso, Bianco, and Doria Tursi. There is a great deal of Ligurian art, such as Luca Cambiaso; as well as Van Dyck who was based in Genova for some years. Guido Reni, Veronese, Giorgio De Ferrari, Titan, Rubens, Bernardo Strozzi, and Mattia Preti are well represented. 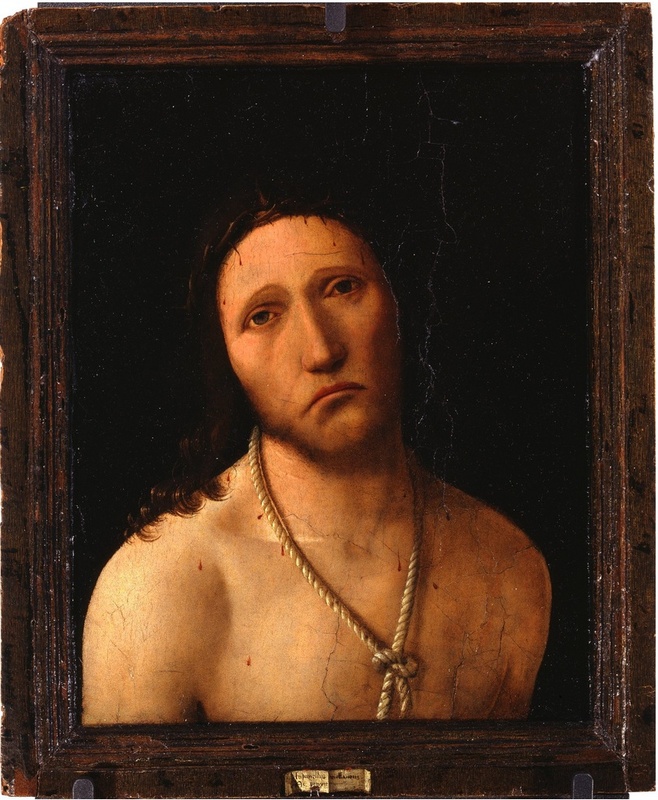 However, our favourites would be the Palazzo Spinola’s Ecce Homo by the great Sicilian master Antonello da Messina, as well as the Diocesian museum/cloisters of the San Lorenzo cathedral, which contains a magnificent room of paintings on denim fabric (Genova pioneered a hard-wearing fabric that eventually would be called “jean”, which was then picked up in Nimes, and became fabric “de Nimes”). The paintings, of the life of Christ, were made in the 1500s for a Ligurian abbey, and seem to be in white paint on blue denim. 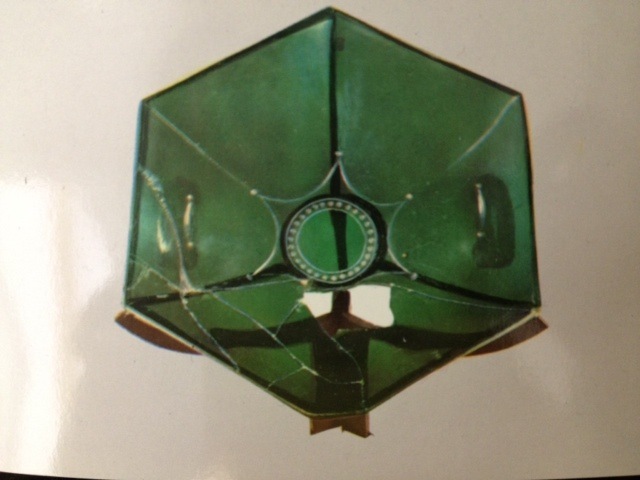 The cathedral treasury is also very interesting for the lovely green chalice once thought to be the Holy Grail, as well as the richly worked charger, thought to have borne the head of John the Baptist. The cathedral is faced with the grey and off-white courses of stone that mark a number of major buildings in Genova, and has a fine little St Lawrence being roasted on a grid-iron above the main portal. On the inside, there are some hard-to-see Byzantine-style frescos near the main entrance, as well as an unexploded 381mm armour-piercing shell from the HMS Malaya, which landed in 1941.